O’in awoke slowly. His mind was fuzzy from medicated sleep and his body felt comfortably numb. When he was finally able to open his eyes, he saw Zaiya sleeping in a chair next to him. Her head rested in the crook of her arms on the mattress next to his legs, and her face, normally tense and frowning, was relaxed. He looked down at himself noting fresh linen bandages around chest and arms. They were snowy white, and a sickly sweet scent radiated off of them. The smell was so strong that his eyes teared up, and, when he tried breathing through his mouth to avoid it, could taste its bitterness. Zaiya woke instantly when he coughed, exhaustion visible in the swollen redness beneath her eyes. “You’re awake,” she said needlessly. “How…long…sleep,” O’in asked, barely able to speak after long disuse. O’in nodded. The tea explained the fuzziness he felt. “I’ll be right back,” Zaiya said, exiting the room, yelling for Herbalist Takit as she slammed the door behind her. Moments later the door opened again revealing a tall Slahor man with deep set eyes and a heavy brow. What length that was left in his short black hair was wavy and stuck out in odd angles as though he’d run his hands through it too many times. As he entered the room, two additional men in similar clothing entered the room and leaned against the wall, observing. Calmly seating himself in Zaiya’s vacated chair, he prodded at the bandages gently asking various questions about pain level in a deep rumbling voice that echoed loudly in the small confines of the room. O’in nodded and shook his head to answer because speaking was so painful. Zaiya and Aldo stood just outside the open door and watched the ministrations anxiously. The Remedon Za’Abat Herbalist took a small knife out of a pouch he carried on his hip and slowly cut through the bandages on O’in’s torso. As he peeled away the cloth the pungent smell of the poultice became stronger, making their eyes water and all but the Herbalist cough. Once the coughing subsided, Takit said, “The more it smells, the better it works.” He used the ruined bandages to wipe away the thick layer of herbs. The skin was the deep red of a severe sunburn. Even the charred skin sloughed off revealing new growth, greatly advanced for only have been injured a few days prior. The Herbalist stared, shocked, “How is this possible?” His companions leaned in, eyes wide and necks craning for a better view, but otherwise they remained emotionless. Aldo and Zaiya entered the room fully and also looked at the exposed skin. “The smell wasn’t that strong, was it,” Aldo asked while Takit carefully removed the bandages on O’in’s arms revealing the same result. O’in looked around curiously. His pain was greatly reduced and just bearable, which he’d thought a result of the tea. “Scars…” he choked out. “There look to be none,” Takit said. He examined O’in more thoroughly, his nose nearly touching him. “Fascinating. I have never seen wounds such as these heal so quickly, and without scars besides!” He took a small folio out of a different pocket in his pouch along with a long, thin barrel-shaped writing utensil that had a small lever on one end, looking much like a pump used to draw water from a well, and a pointed tip on the other. After pressing the lever a few times he made notations within the folio using the strange apparatus, pumping it as ink ran dry, all the while mumbling to himself as he wrote. Takit waved a hand dismissively at her and kept writing. O’in, Aldo, and Zaiya looked at each other awkwardly but said no more until the Herbalist raised his head once more. He rubbed his hand over his face leaving a small streak of black ink over one eye. “There is no explanation. Wounds such as this, if they heal at all, take weeks, months, and years. They always leave massive scars that can inhibit movement. I see nothing like that here.” More aside to himself than to the others. “Wa-ter,” O’in croaked questioningly, interrupting the Herbalist. Herbalist Takit started and looked at his patient as though surprised to be addressed during his theoretical process. After the momentary pause he addressed one of the men still leaning against the wall. “Fetch some water and cooled meat broth. If we’re to study him further, he needs to gain his strength back.” The man rushed out of the room on his errand. Takit nodded and stood. He gestured to his remaining companion and they walked out. A moment later, the first man returned carrying a tray with the water and bowl of broth that had been requested. He set it down on a table next to O’in’s head and left as well. Zaiya sighed, sat down into the vacated chair, and picked up the water cup. She helped O’in drink a little before spooning some broth into his mouth. “If only,” Zaiya said. She continued to alternate between the broth and water until O’in turned his head away. “Hurts,” he murmured before falling asleep. The next few days showed a continued acceleration in O’in’s healing. He was constantly surrounded by either Zaiya or Aldo, plus Herbalist Takit and at least one of his assistants. By the end of the third day after he’d woken from his drugged sleep, he took walks of ever increasing length. He continued to feel the Pull of the flames any time he was in sight of a torch or other fire source, but he pushed down the desire. It still continued to build inside him until flames would reach towards him, seemingly of their own accord. When this started, O’in heard the scratching of the peculiar Wajan writing utensil as Herbalist Takit made notes in his folio. On his seventh day since arriving at Yi Shae Yu’An Moshu, O’in sat on his bed shirtless and alone for the first time. He ran his hands down the nearly fully healed skin. It felt rougher than before his injury but, otherwise, unscarred. His brief respite ended abruptly when Herbalist Takit barged into the room without knocking, followed only by one of his colleagues. Zaiya and Aldo were not to be seen. O’in quickly pulled his shirt over his head, embarrassed to be caught rubbing his chest in such a fashion. “…Di-dissect,” O’in asked, phased, but was ignored. “…I don’t see that we should ever know either. We spoke with Zaiya and she mentioned that you were able to hold more fire than even an intermediate caster could before you lost your concentration. As such, it is our belief that you are the most powerful Slahor Caster of our age.” He said this with a scholarly air as though presenting to a room full of his colleagues. “Think nothing of it.” Takit and his companion turned and walked out of the room. As O’in made his way slowly towards the waiting wagon, he thought about what the Herbalist said. Powerful, am I, he thought. Not likely. Lucky? Probably. The journey back to the Akademie was uneventful. O’in was not fully healed yet, but he was able to move around comfortably enough, although somewhat stiffly. Zaiya helped get him settled in a room near her own at the end of the hallway in the Slahor living quarters while Aldo notified Kayt of their return. He returned with her moments after O’in settled into his bed, exhausted after the journey. Several weeks later, just as the morning sun rose over the Remedon Za’Abat training grounds, O’in stood next to a large bonfire with both hands resting inside the flames. Sweat ran down his face, not from the heat, but from the exertion of collecting fire within himself. The temptation to gather more than he could handle was still nearly more than he could bear. In frustration, he released the flames he held back into the bonfire with a woosh. “I still can’t control it,” O’in said, frustrated. “It’s as though it all wants to enter my body. It takes everything within me not to allow it. How can fire have a mind of its own? !” He paced a little, scratching his head vigorously with both hands in frustration. “Why did he have to say I’m more powerful than a normal Remedon Za’Abat,” O’in asked, referring to Herbalist Takit. “Then why can’t I control it,” O’in burst out. At his shout, the bonfire leaned towards him as though reaching out for an embrace. O’in stared at her incredulously, the Pull already tempting him to reach into the flames. Although spring had finally taken hold, and the air was warm, the water was still as cold as the snow it originated from higher in the mountains. Zaiya stared back, unblinking, until O’in removed his shoes and stepped into the water, gasping at its coldness. He made his way to the largest and flattest stone, clambering onto its sun-warmed surface. Crossing his legs, he straightened his back and rested his hands on his knees, palms up. Feeling foolish, O’in closed his eyes and listened to the sound of the water rushing past him. The absurdity of what he was doing faded as the sounds of the forest and river grew within him, taking over his senses. 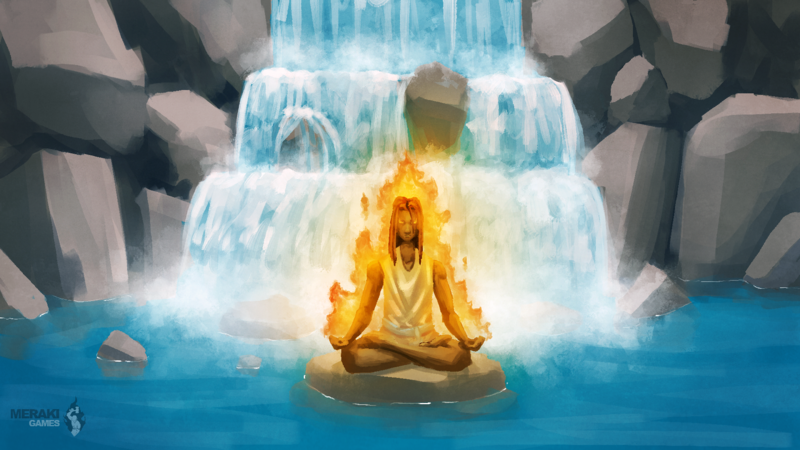 O’in’s breathing evened, and he felt a spark within his chest. In that soft glow he found all the anger his life had stored there – the desire to please a father even though he disagreed with the cruelness the man possessed, the failure to help those around him who needed it, the loss of his best friend, perhaps, to death, the failure to curtail his powers resulting in destruction and pain, and, above all, the betrayal of his family upon finding out who he really was. Concentrating on the flare within, he pushed the pain it held away. It clung to his heart for a moment until, with one last final push, it burst into flame and was gone. Opening his eyes, O’in felt a calm he’d never before experienced. A confidence he never knew he could possess filled him. He stared at the beautiful scenery in front of him for a few moments before unfolding himself and making his way back to Zaiya. The fire was still burning hot even though she’d fallen asleep, laying on her side on a soft cushion of moss and fallen leaves, with her head resting on her arm. He noticed that, although the Pull still tugged at him, it no longer overwhelmed him. He could ignore it if he wished, and the flames no longer leaned towards him. The setting sun lit Zaiya’s face through a gap in the tree branches. O’in saw, for the first time, the smoothness of her skin and how long her dark eyelashes were. He shook her shoulder gently after a brief moment. She woke instantly, sitting up and folding her legs beneath her as she rubbed an eye with the heel of her hand, glancing at the unbending campfire, and smiled. “It’s nearly dark,” Zaiya said. “I didn’t. Everyone must look within themselves eventually, though the method and time in their lives is different. I felt it was time you tried.” Zaiya Pulled the fire into herself until the coals darkened and cooled. She turned and led them back along the stream towards the Akademie. O’in hesitated a moment and stuck a single finger into the fire. He pPulled it into himself, only allowing it to fill to the first joint. He raised his hand, leaving some of the flames still in Zaiya’s palm, and stared at the small blaze that flickered along his nail. A smile slowly rose until he laughed in joy. “I can do it,” he whispered softly. Zaiya leaned in and blew out the fire encircling O’in’s finger. “You should take this as a lesson. I’m always right.” She laughed and turned, continuing their journey home. O’in’s training began again in earnest after he learned how to calm himself. His true aptitude and talent shone in the speed at which he mastered each lesson. He’d let go the pain of his childhood, for he now considered himself, finally, a man. It wasn’t uncommon to see him laughing and joking with various groups of casters from all nations.